Ontos: "Anything That Old Battleax Got She Deserved—Provided There's a Corpus Delicti"
"Anything That Old Battleax Got She Deserved—Provided There's a Corpus Delicti"
By Arthur T. Harris (pseudonym, ?-?). First appearance: Fantastic Universe, June 1956. Short short story (6 pages). "Vengeance can be very complete when it ends with a refrain to the tender lyric: 'All of me!'" Let's face it: Some relationships were never meant to last; while the song tells us that break-ing up is hard to do, in this instance a four-ounce bottle of Madame Outre's Shangri-La Bath Salts makes it oh-so-easy . 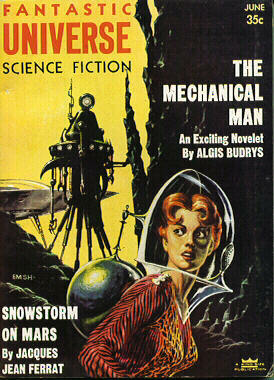 . .
- A very short bibliography of Arthur T. Harris's stories is on the ISFDb (HERE). YouTube (HERE; 3 minutes 52 seconds) is no worse than most. "Had He Fallen into the Den of a Murderer?" "A Bullet Starred the Plating Between the Gauges"
"Can You Get Sherlock Holmes by Wireless?" "I Want This 'New York Roddy'!" "Shots Crashed and I Flopped in the Mud"
"He'll Have Quite a Surprise in Store for Him"
"I Wouldn't Travel in That Car Not for No Money"
"When His Body Was Found the Diamonds Were Gone"
"An Amazing Case of Barratry on the High Seas"